When my classmates discovered my blog, they immediately thought it was about time they saw some of the good stuff too, so I decided to take some cookies to the exam (the class in question is my evening class Polish, I quite like languages). I didn’t want to do the same old tried and tested recipes all over again, so I decided to have some fun with it and come up with my own combinations. 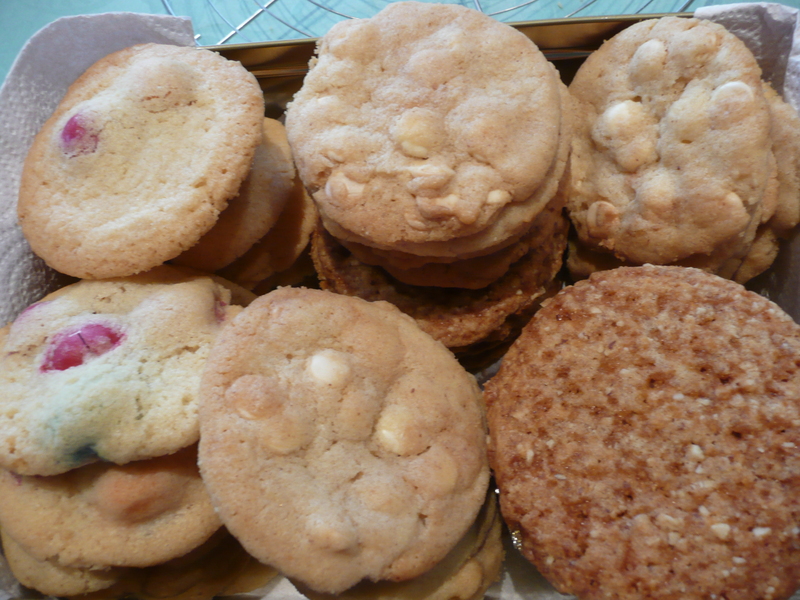 I made a basic cookie recipe, divided the dough in 3 part and went for 3 different combinations: M&Ms cookies, white chocolate and peanut butter cookies and bresilienne cookies (with nuts and caramel) and they all turned out great, so there were not a lot of cookies left for my colleagues the next day! Preheat the oven to 140 C and line two baking sheets with greaseproof paper. Mix 250 g softened butter (you can use margarine as well) with 350 g soft brown sugar until fluffy and soft. Add 1 egg and beat well until incorporated. In two batches, add 375 g self-raising flour (or use regular flour and add 1 tsp baking powder as well), a pinch of vanilla powder (I used a small bag of vanilla sugar, you could use 1/2 tsp vanilla extract of the seeds of half a vanilla pod as well) and a pinch of salt and mix well. Now add 380 g of whatever you like, or split the dough in 3 parts and add 125 g m&m’s to one part (I used the one with peanuts in them and left them whole for a fun effect and maybe also because I’m a bit lazy). For the second part, I opted for 125 g white chocolate (chopped) and 2 tsp peanut butter and for the final part I added 125 g bresilienne mix or praline (I still had enough left from making the caramel and nuts for my almond praline cake – it keeps well in an airtight jar). Enjoy while listening to Mahna-mahnam from the muppet show.